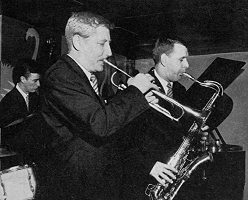 Born in 1929 trumpeter Bert Courtley had a dance band background, including Teddy Foster, Vic Lewis and Ken Mackintosh before becoming noticed in the musically excellent but short lived Kathy Stobart band at the beginning of the 1950s (Derek Humble was also in the band). He married Kathy in 1951 and the two succeeded in making their separate careers while Kathy gave birth to three sons. Courtley and bass player Jack Seymour co-led a big band for a time during 1956 and after short spells with Tubby Hayes, and the Jazz Today Unit he joined Don Rendell in 1957. In 1958 he moved to The Johnny Dankworth Orchestra for a while and in the year following he formed part of the specially assembled "Anglo American Herd" led by Woody Herman. Alongside Renauld Jones, Nat Adderley, Les Condon and Kenny Wheeler he emerged as the strongest soloist in the section. He then co-lead a group with Ronnie Ross from 1960 to 1961 as well as free lancing, including working with the Harry South Big Band in the early 1960s. From early 1960 he had been playing with Ted Heath, depping when needed, because he was a jazz player usually on third or fourth trumpet. One night in 1962 he played split lead with Bert Ezzard, Heath liked what he heard and within three days asked him to join the band. He actually replaced Bobby Pratt and was with the band until 1965 and later in 1967. Kathy Stobart gave a graphic interview to Jazz Journal (August 2000) in which she lays the blame for Bert's early death on the stresses of playing in the Heath band (right). He suffered ill health before his early death in 1969 at the age of 40, newspaper reports giving the cause of death as alcoholic poisoning. "From early 1960 Bert had been playing with Ted Heath, depping when needed, because he was a jazz player usually on third or fourth trumpet. One night Bert Ezzard said 'You're going to have to play split lead tonight with me'. They always had a split lead for the trumpets because it was a very hard, high book to play. Apparently the band took off and within three days Ted (Heath) phoned and asked Bert to join the band. Bert was a good jazz player and his timing was very good, so when he played lead the whole thing started to go. I didn't want him to join Ted. I knew what it was like. Lots of hard drinkers, alcoholics and addicts. It was a hard band. If you did anything wrong, everybody pointed the finger. There was a bitter thing in it. But it was good money. They were getting �60 or �70 a gig. In the 1960s that was a lot of money. The stress got more and more, then the hard drinking took over and he started to be ill with his stomach. He was taking bottles of a patent medicine which you could buy then, and was full of all sorts of things. It was addictive and eventually they banned it! His nerves were bad and finally he had to leave the band, because he was just going to pieces. It was sad. We were fairly broke by then, Bert didn't have any work so to help out I took a job as a demonstrator at Bill Lewington's music instrument store in London's West End. During all that time Humphrey (Lyttelton) still employed me. I was the regular dep. I also had a casual quintet with trombone player John Picard in the late 1960s. The doctor told me that if Bert didn't look after himself he would kill himself. He succeeded! In September 1969 Bert died. It was two days after his 40th birthday". Some of these titles were issued with the Esquire 5 prefix* to the number, (i.e. not really jazz), and none have been re-issued. Ronnie Simmonds, Stan Reynolds, Bert Courtley, Terry Lewis (tp), Johnny Keating, Ken Goldie (tb), Ronnie Chamberlain (as,cl,sop), Derek Humble (cl,as), Kathy Stobart (ts,vcl), Pete Warner (ts), Jimmy Simmonds (bs), Arthur Greenslade (p), Pete Blannin (b), Peter Coleman (d), Marion Williams (vcl), Vic Lewis (dir,vcl). Vic's Riff/Everywhere/Be My Love*/The Apple/Festival riff/The Moon Was Yellow/Foggy Day/Tea For Two* (vcl MW, JK + rhythm section only). Bert Courtley (tp), Derek Humble (as), Kathy Stobart, Pete King (ts), Alex Leslie (bs), Dennis Armitage (p), Len Harrison (b), Pete Bray (d), Franklin Boyd (vcl). He Was A Good Man/Idaho (FB vcl)/Old Black Magic/Lover Come Back To Me. Why Do I Love You*/JD to VL*/Street Scene*/Heru*. Bert Courtley, George Boocock, Al Spooner, Doug Taylor (tp), Tony Russell, Eddie Harvey (tb), Jimmy Walker (as), Norman Hunt, Jack Massey (ts), Gery Gerke (bs), Don Innes (p), Jack Seymour (b), Douggie Cooper (d). Bert Courtley (tp), Don Rendell (ts), Ronnie Ross (as,bs), Ken Moule (p), Arthur Watts (b), Don Lawson (d). Ignis Fatuus*/Star Eyes^*/I Know Why*/Takin' A Chance On Love*. Bert Courtley (tp), Don Savage (as), Art Ellefson (ts), Bernie George (bs), Bobby Heath (p), Bill Stark (b), Art Morgan (d). Midnight Sun/All The Things You Are/There Will Never Be Another You/First Edition. Humphrey Lyttelton, Bert Courtley (tp), Maurice Pratt, Rick Kennedy, Alec McGuinness (tb), Ronnie Ross (as), Jimmy Skidmore, Don Rendell (ts), Alex Leslie (bs), Ron Davey (vib), Ian Armit (p), Brian Brocklehurst (b), Eddie Taylor (d). Manhattan/Singin' The Blues/Sweethearts On Parade. Bert Courtley (tp), Don Rendell (ts), Ronnie Ross (as,bs), Eddie Harvey (tb,p), Kenny Napper (b), Phil Seamen (d). Top score*/Mood Indigo*. (Other titles on LP by others). Bert Courtley (tp), Don Rendell (ts), Ronnie Ross (as,bs), Eddie Harvey (tb,p), Pete Blannin (b), Andy White (d). It's Playtime*/Johnny Come Lately*/Hit The Road To Dreamland*/The Lady Is A Tramp*/Packet Of Blues*/Dolly Mixture*/My Friend Tom*/This Can't Be Love*/By-pass*/Tickletoe*. Kenny Baker, Jimmy Watson, Bobby Pratt, Pete Winslow, Bert Courtley (tp), Don Lusher, Maurice Pratt, Ken Goldie, Jackie Armstrong (tb), Jack Lewellyn, Chick Lavelle (g), Jack Fallon (b), Phil Seamen (d). Bakerloo Non-stop* (Other titles on this LP by others). Bert Courtley (tp,mell), Ronnie Ross (as,bs), Eddie Harvey (tb,p), Pete Blannin (b), Andy White (d). Blue Grass*/Red Prune*/Blues For Terrasita*/Smoke Gets In Your Eyes*#/T's And A's*/The Serpent*/Slidin'*. Bert Courtley (tp), Eddie Harvey (p), Pete Blannin (b), Eddie Taylor (d). New Blues For Old*/Sweet And Lovely*/Bertrand's Bugle*/Chocolate Shake#/. Bert Courtley (tp), Don Rendell (ts), Eddie Harvey (p), Pete Blannin (b), John Dougan/Eddie Taylor* (d). Nat Adderley, Les Condon, Bert Courtley, Renauld Jones, Kenny Wheeler (tp), Bill Harris, Eddie Harvey, Ken Wray (tb), Woody Herman (cl,as), Art Ellefson, Don Rendell, Ronnie Ross, Johnny Scott (saxes), Charlie Byrd (g), Vince Guaraldi (p), Keeter Betts (b), Jimmy Cambell (d). The Preacher/Like Some Blues Man, Like/From Pillar To Post/Four Brothers/Opus De Funk/Early Autumn/Playgirl Stroll/Wood Chopper's Ball. Band including :Joe Harriott (as), Bert Courtley, Bobby Pratt (tp), Hank Stamps (bass-tb), "Don Carlos" (p), Phil Seamen (d,perc), Kenny Graham (arr). Other musicians are not detailed. T'Aint What You Do/Frenesi/Oh Pampanino/Cha-Cha-Cha Charlie/Taboo/Crazy Latin/Tangerine/Sunset/In A Little Spanish Town/Chu Chin Cha-Cha-Cha/Adios Maraquita/Linda/Beats In The Belfry. Big band featuring Bert Courtley (tp), Tubby Hayes (ts), Dave Lee (p) + others unknown. Lover Come Back to Me*/Bye Bye Blackbird*/Georgia On My Mind*/Chloe*/Piece Of Cake#*/You, You, You*/London Derriere*/Blue Denham*/I Cover The Waterfront*/Cheek To Cheek*/Beyond The Sea*. Bert Ezzard, Bert Courtley, Eddie Blair, Duncan Campbell (tp), John Edwards, Keith Christie, Ken Goldie (tb), Ronnie Chamberlain, Johnny Scott (as), Bob Efford, Henry Mackenzie (ts), Ken Kiddier (bs), Derek Warne (p), Dave Goldberg (g), John Hawkesworth (b), Jack Parnell (d), Vic Lewis (ldr). Basic Riddle/Bass Is Loaded/Sax Blue/Town Talk.